There are many home and building maintenance tasks that do not require professional assistance, but for the most part, plumbing is not one of them. If you have plumbing issues or are in need of plumbing installation services in the Rockford or Rockton, IL, area, consider these five reasons to hire a trusted plumber from Warren Plumbing. •	Expertise – Whether installing a completely new system or repairing an existing system, a professional plumber will do the job right. •	Safety – Attempting some projects on your own can put you at risk of injury and your property at risk of significant immediate or eventual damage. Don’t take that chance with new plumbing installations, remodeling projects or plumbing repairs for your Rockford and Rockton, IL, property. •	Qualifications – Many plumbing projects, especially residential and commercial plumbing installations in Rockford and Rockton, IL, must be completed by a licensed plumber. This ensures the plumbing job adheres to Illinois plumbing codes. •	Knowledge of efficiency systems – Conserving water saves you money and helps the environment. A professional plumber can maximize your water conservation with modern water heaters, low-flush toilets and other water-saving products. •	Responsibility –If you break something as a do-it-yourselfer, you are responsible for the damages. If a licensed and insured plumber breaks something while installing or repairing a plumbing system, it is the plumber’s responsibility to compensate you for the damages. 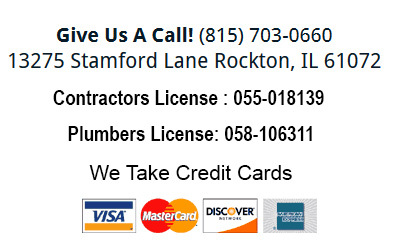 Professional residential and commercial plumbing installations and repairs in Rockford and Rockton, IL. Now that you understand the importance of hiring a professional plumber for all plumbing jobs, big and small, you may be wondering how to find the right plumber. When searching for a professional plumber in the Rockford and Rockton area for residential and commercial plumbing jobs, consider the following advantages of making Warren Plumbing your go-to company for all things plumbing. •	Over 30 years of experience – We have extensive experience working with residential and commercial systems. Your new plumbing installation will be efficient and up to code, while plumbing repairs for your Rockford or Rockton, IL, home or business will be accurate and effective. •	Locally owned, family operated – Warren Plumbing is a father-son plumbing business in the Rockford and Rockton, IL, area. As members of the local community, we value the integrity of our work and the relationships we establish with each customer. •	No job too big or small – Our extensive knowledge of residential and commercial plumbing systems enables us to complete nearly any plumbing installation and repair in the Rockford and Rockton, IL area. •	12-month guarantee – We are dedicated to customer satisfaction on every job. To confirm that dedication, we provide a 12-month warranty on all of our residential and commercial plumbing jobs in the Rockford and Rockton, IL, area. •	Competitive pricing – We don’t run any special promotions or sales events because we keep our prices low year-round. You can always rely on Warren Plumbing for fair, honest prices on residential and commercial plumbing work in the Rockford and Rockton, IL area. While you can rely on Warren Plumbing for any plumbing job, big and small, for your home or business in the Rockton, IL area, new plumbing installs are our specialty. With over 30 years of plumbing experience, we install efficient, code-compliant plumbing systems. For more information regarding our plumbing installation services in the Rockton, IL, area or other plumbing services such as remodels and repairs by Warren Plumbing, please call today. Copyright © 2019 Warren Plumbing, all rights reserved.